Born on March 30, 1853 in Zundert, Holland, Vincent van Gogh grew up in a rural vicarage saturated with petit bourgeois values and a ready supply of Protestant piety. He was exposed early on to the variegated fabric of human suffering as well as humanity’s incessant search for prosperity and happiness. During his twenties, van Gogh grappled with existential questions while working haphazardly as a picture dealer, schoolteacher, bookshop clerk, and missionary. In the early 1880s, he committed himself to a life of art. To his brother Theo, van Gogh declared that “if for a moment I feel rising within me the desire for a life without care, for prosperity, each time I go fondly back to the troubles and the cares, to a life full of hardship, and think: it is better so, I learn more from it, it does not degrade me, this is not the road on which one perishes.”||Between the autumn of 1881 and his death on July 29, 1890, van Gogh painted nearly 900 oil paintings that brought him neither wealth nor fame. Today this oeuvre is regarded as a cornerstone of modern art and pictures attributed to van Gogh are revered as works of a genius. In the course of a century, a posthumous “van Gogh cult” has been so deeply ingrained into the fabric of the history of western art that it has become difficult to distinguish between the man and his art: both are earmarked by tragedy. The drawings and paintings van Gogh left behind tell a different story. His oeuvre, which contains both masterpieces and botches, is not homogeneous and while some of his works betray the strong presence of human hardship, others are odes to joy. 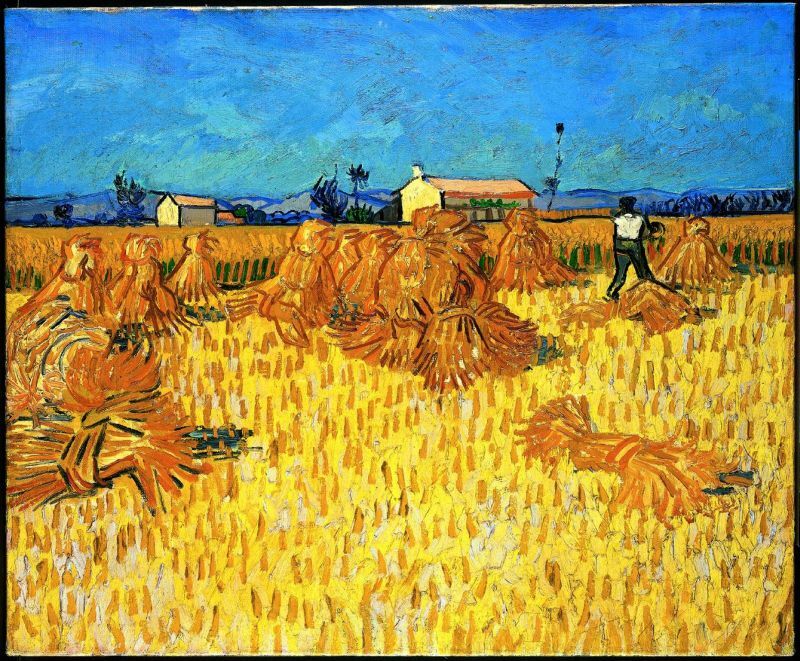 Harvest in Provence, painted near the town of Arles in southern France, belongs to the latter category. The work is part of a series of half-a-dozen oil studies executed in the summer of 1888, in which van Gogh engages the harvest motif from different visual angles almost as an ethnographer documenting the life and customs of an agricultural society. The centerpiece of that series is The Harvest in the collection of the Van Gogh Museum in Amsterdam.||Van Gogh moved to Arles in February 1888, after spending two years in Paris. Amidst the Provençal corn and wheat fields van Gogh’s pictorial style underwent several transformations induced partly by inspiration he drew from Japanese prints and the works of his contemporaries, partly on account of his own temperament and aspiration to capture in paint the colors, tempo and emotive flavor of his new home. Harvest in Provence, most likely painted on the spot shortly before June 20, 1888, depicts a fragment of rural life as van Gogh experienced it on a given summer day in his thirty-fifth year. The painting evokes a state of flux: the brushstrokes in the sky are blown about by a nervous summer wind; the line of the horizon undulates under solar heat; the full-bodied farm buildings in the distance crave to be filled with nature’s produce; and in the foreground the bundles of corn dance in the breeze as a final goodbye to their earthy abode. Humanity’s presence in the picture is limited to a lonely farm-worker indicated with a few strokes of paint. As a whole, however, Harvest in Provence is a eulogy to human life—a life van Gogh embraced so compassionately that ultimately he let is slip through his fingers.